After two draws and two defeats the omens weren't looking good for a trip to Jenner Park in the quarter-final of the BBC Sports Department Flagship Tournament. Barry Town, about to retain their League of Wales title by a another massive margin, had scored 100+ league goals with Eifion Williams and Darren Ryan regularly on the score sheet. They had experienced players running through their squad. Recently though there had been a few hiccups: draws against Ebbw Vale and Rhayader Town had sown the seeds of doubt in the professional players minds, would they cope with Mitchell and Cohen’s pace? Could they penetrate the mean defending machine, marshalled by the revelation of the season - Neil O’Brien? The match, being screened live by BBC Wales, turned into a cracker. The Dial "M" Party Posse assembled at the now customary Twynyrodyn watering hole, The Baili Glas Inn, landlady Marilyn promised the boys curry and chips on return from the game. Quick pints, minibus arrives, traffic jams reached by Treforrest, lost in Barry, Hulby gets the blame as normal. Eventually arrive 6.40 p.m: game already started. A quick scan of the security surrounds of Jenner Park reveals my complimentary ticket to the match. A road sign bunks me up over the fence and under the barbed-wire, whilst an overturned wheelbarrow reduces the strain on my ankles as I land inside the Park. The Belly Boys: Baldy & Butch Dingle, follow my lead with Tim being the only payer. The ground is full: unfortunately full of under 14 year olds. 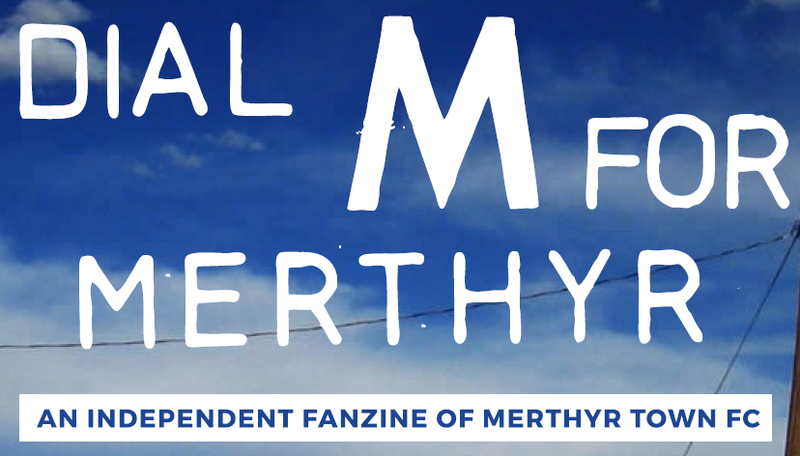 A bit of a pisser really as most Merthyr fans go to watch football at Penydarren Park to get away from the everyday nagging of partners and children, to get a bit of piece and quite really. The game itself was superb. Barry players were all very comfortable on ball but I don’t think that they expected such stubborn resistance from a resolute Merthyr team. Neil Thomas was solid in goal. Abraham and O’Brien’s arial prowess combined with the 100% dog of Barnhouse. Wigley and Willo restricted the Barry attack to very few clear cut chances. Everyone in midfield worked hard for the full match, with Lossy excelling on his return to Jenner Park. Summers of course scored the all important winner and also came close for the Martyrs on numerous other occasions. So the unexpected had become reality. A win against Barry Town at Fortress Jenner. Here’s hoping for a final with Newtown so that the Merthyr fans can really "C the C" just to piss off Gavin Grosvenor and the rest of the vast Newtown (boring as Barnsley) tossers.